The first self-driving buses have taken to the streets of Paris on a route between two train stations. There are now two such buses, each of which can take up to six people the 200 meters over a bridge between the Lyon and Austerlitz train stations. The buses will be test-trialed for the next three months in a designated lane, without entering Paris’ busy traffic. The city’s authorities consider the new driverless buses a breakthrough. 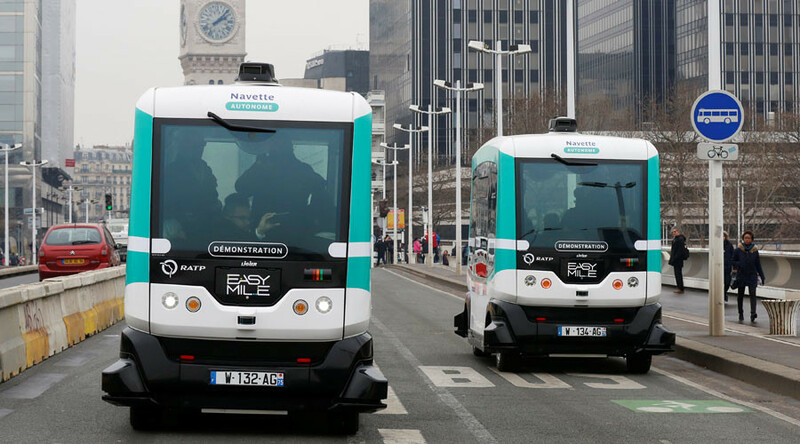 “Autonomous vehicles represent a revolution for every city on the planet... which will change our urban environment and public space in a spectacular fashion over the next 20 years,” Paris Deputy Mayor Jean-Louis Missika told reporters. Although Paris has one of the best public transport systems in the world, like most capitals, it is difficult to reach from the suburbs, turning each morning commute into an ordeal. “We dream one day of having buses like these parked near RER stations which would come to collect passengers on demand,” Elisabeth Borne, the head of Paris’ transport network, explained. New in Paris! An driverless shuttle on Charles-de-Gaulle bridge between Gare de Lyon & Gare d'Austerlitz! The RER is a train network connected with the Paris metro that takes passengers to the suburbs. Paris isn’t the first city to introduce driverless transport in France, however. Lyon, the country’s second largest city, boasts a driverless metro, as well as autonomous electric buses. Lyon’s Line D, the first fully automatic metro line in France, began operating in 1991.